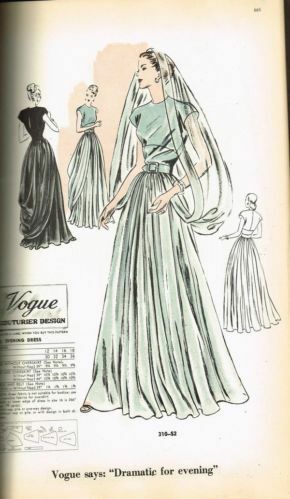 I found this image from a vintage pattern (I am assuming 30’s-40’s ish) and I thought it was a lovely idea. A veil is joined into the waist and can sit over the head as a veil or down the skirt as a bustle. The Image shows the veil ending at about her wrists but I would guess it would be possible to make it longer, this might just mean that the back of the skirt might need to be lengthened so the veil won’t drag on the floor. This entry was posted in Blog, History of fashion, veil. Bookmark the permalink.